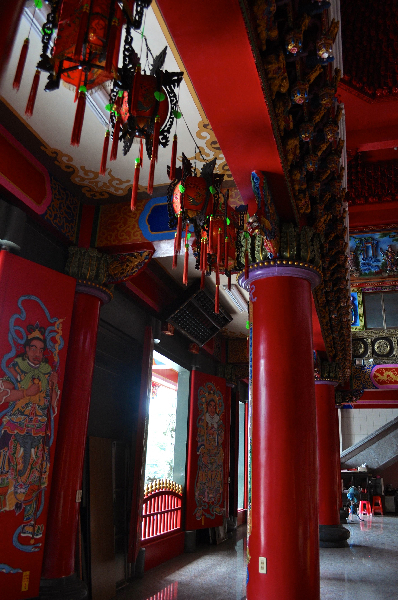 Once upon a time, in a village high in the mountains in North East Taiwan, with the sea far below, lived nine families. These families were very happy, but they all had one problem in common- it was such a long way to the shops. To obtain provisions they’d need to walk the long path down the mountain, buy what they needed from the city below, and then carry it all the way back up the hill. The villagers formed a cooperative, of sorts. Each family would take their turn to go to the shops, returning with nine portions of each item being purchased. The village was called Jiufen. 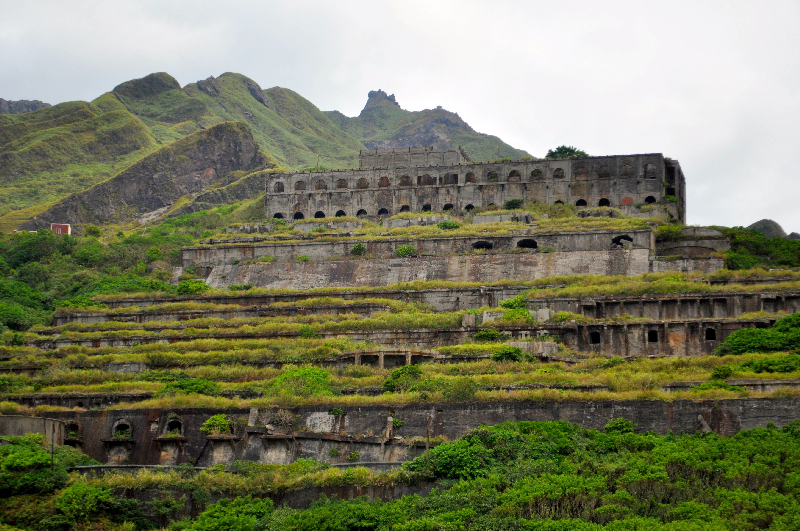 And then gold was discovered both here in Jiufen and in the neighbouring village of Jinguashi. 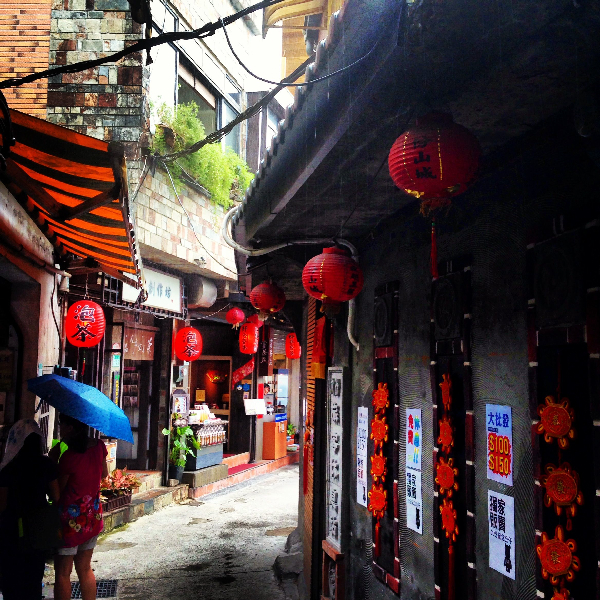 No longer a nine family town, Jiufen grew so prosperous it was known as “Little Shanghai.” Indeed the narrow streets with their lanterns look just like the Shanghai portrayed in the opening scenes of the second Indiana Jones. 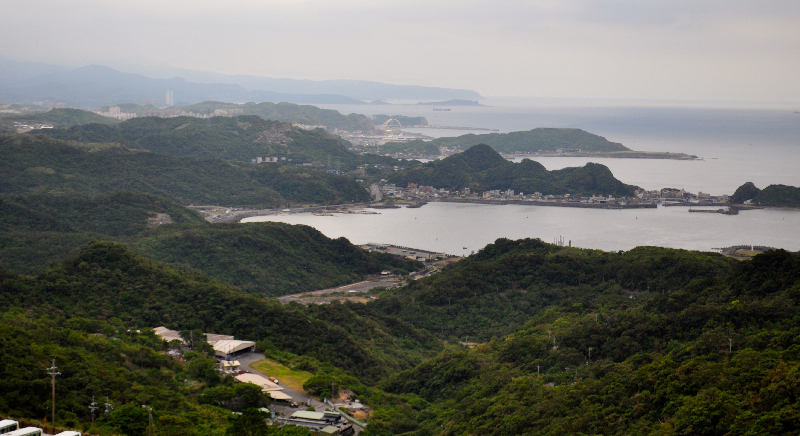 Jinguashi, on the other hand, was the site of a Japanese prisoner of war camp during WW2. After the mining closed, following the end of WW2, both towns fell into decay for a number of years. 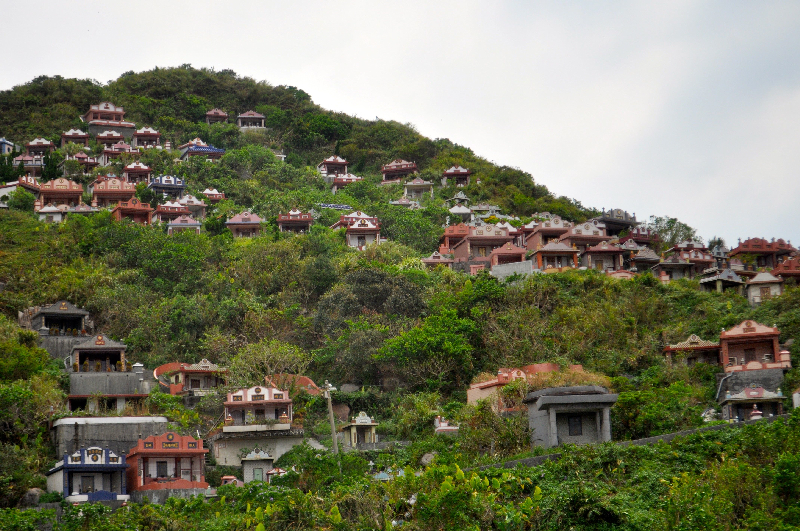 Jiufen was the first to be brought back to life with a film detailing the Japanese occupation being set here in 1989. 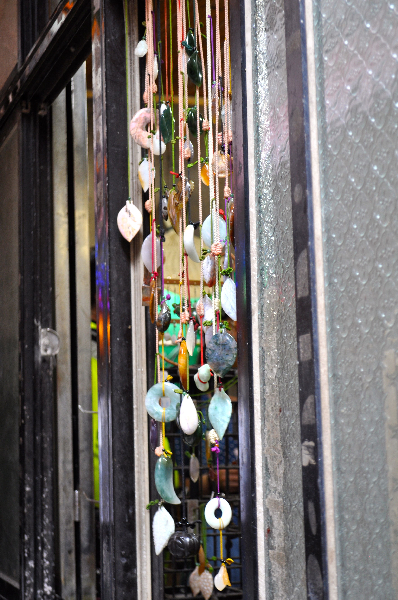 Now the narrow streets are full of tourists- on weekends they can be shoulder to shoulder. 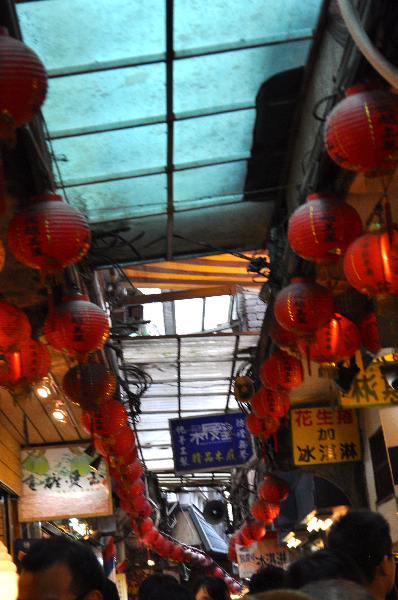 The old covered, lantern lined street is the main attraction here, winding steeply up through shop houses selling quality traditional Japanese and Chinese products, crystals, jewellery, and art as well as tourist tatt. 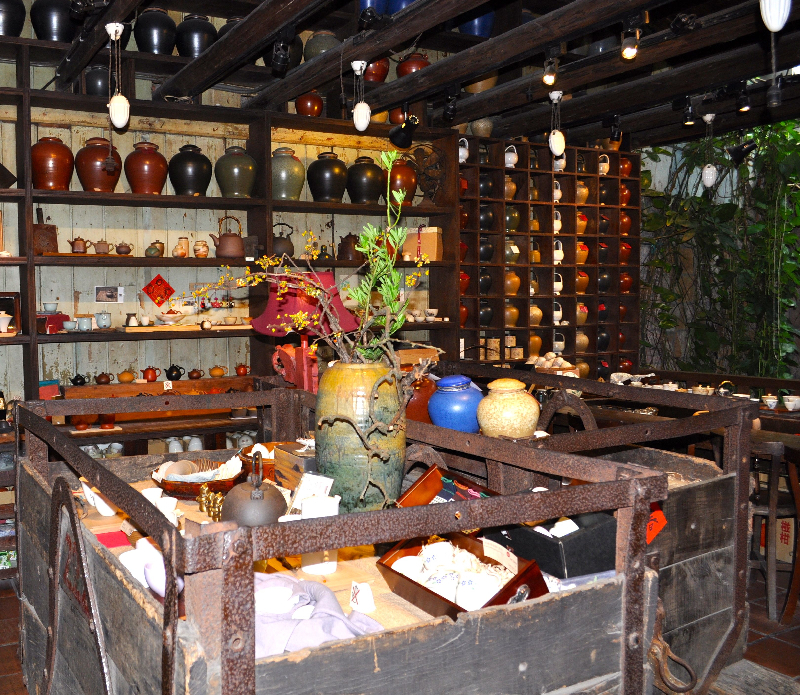 My favourite was the ceramic tea making products and art available at the Jiufen teahouse, and another selling soapstone Chinese seals or name chops. 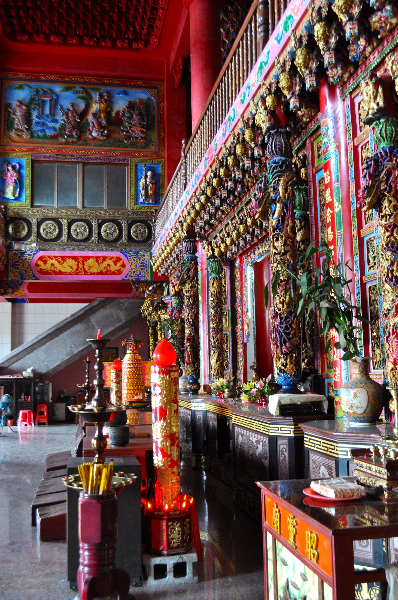 At the top of the street, admire the view, take some tea in a traditional teahouse and check out the restored theatre with its film memorabilia devoted to the movie that changed Jiufen’s fortunes- City of Sadness. 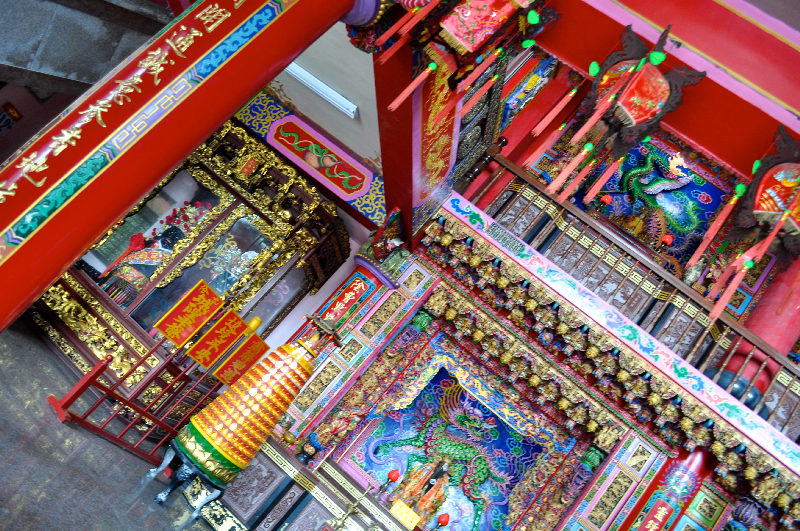 Although this temple dates back 200 years, it was expanded at the height of the gold rush in order to accommodate the numbers of miners who came to pray for their luck the change. 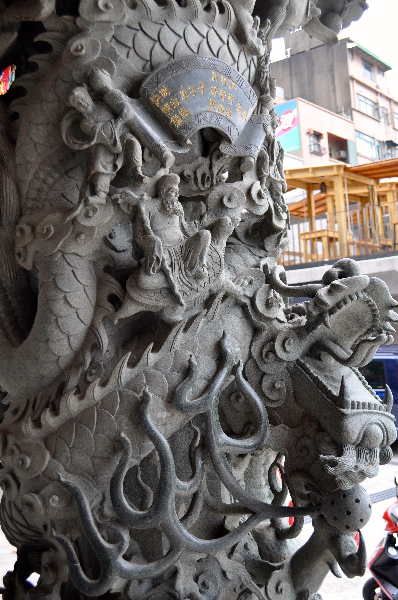 I won’t bore you with the meaning and dedication behind this temple, but suffice to say it’s a blend of the influences of the time- Japanese, Western and Chinese…it’s also extremely beautiful. My guide attempted to point out how the beams were in place without nails and how the carvings were all hand done, but I was too busy taking in the colour and the detail of, well, everything. You can get a bus from Zhongxiao Fuxing MRT, or a fast train from Taipei followed by a bus at nearby Ruifang. Alternatively, you can do as I did and take a half day tour- especially you you’re time limited. 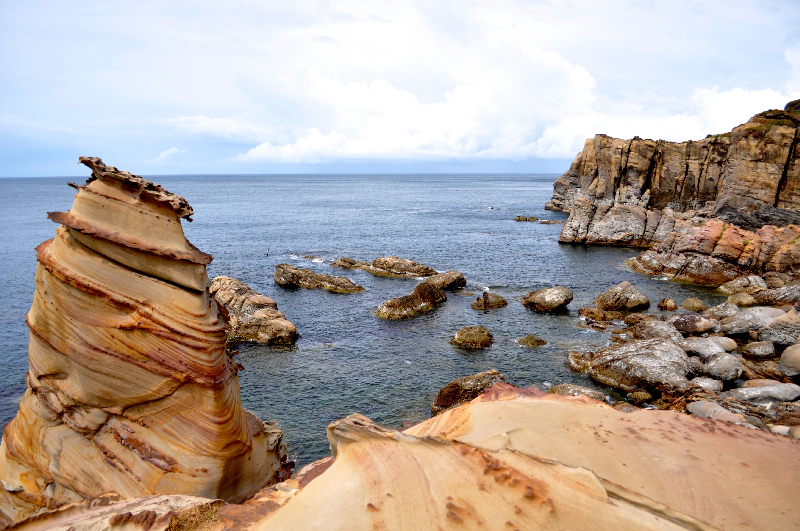 Although more expensive (a 4 hour tour will set you back about $36AUD) you also see a little of the coastline, and stories about the way things were. As an aside, did you know it’s good feng shui (for the wealth of future generations) to be buried facing the sea? It’s all to do with the direction of the flow. I was fortunate in that the tour I was on had myself and a Japanese girl. The driver, Wang, was my personal tour guide, while a Japanese speaking guide came along to assist her. Taiwanese snack foods a plenty. 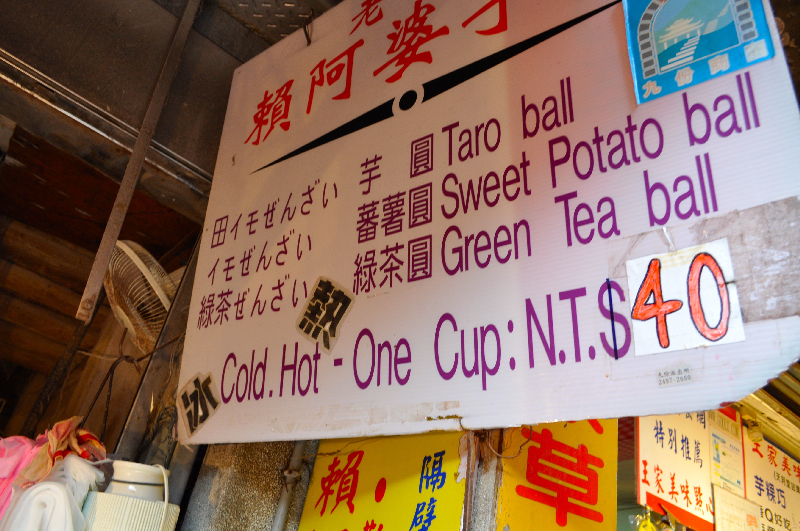 Yam balls and sweet potato or molasses cakes are popular, as are pork dumplings, stinky tofu, sausages from “mountain pig” ie boar, and the other usual suspects. 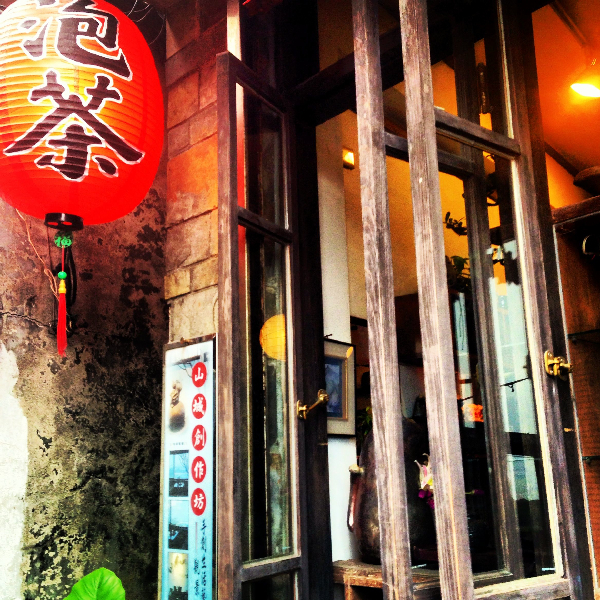 If you have the time, linger over tea in one of the wooden teahouses. 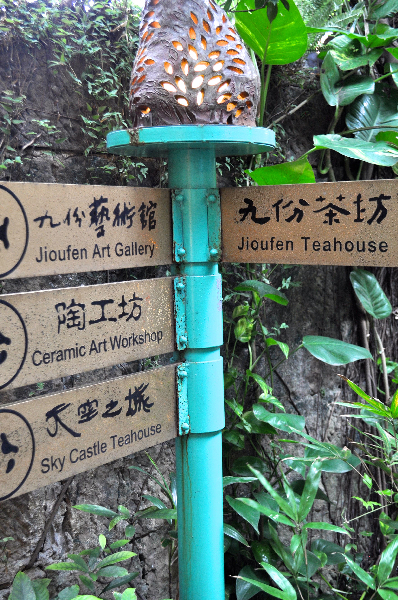 You might also see Jiufen spelt: Jioufen or Chioufen…it differs depending on the source. 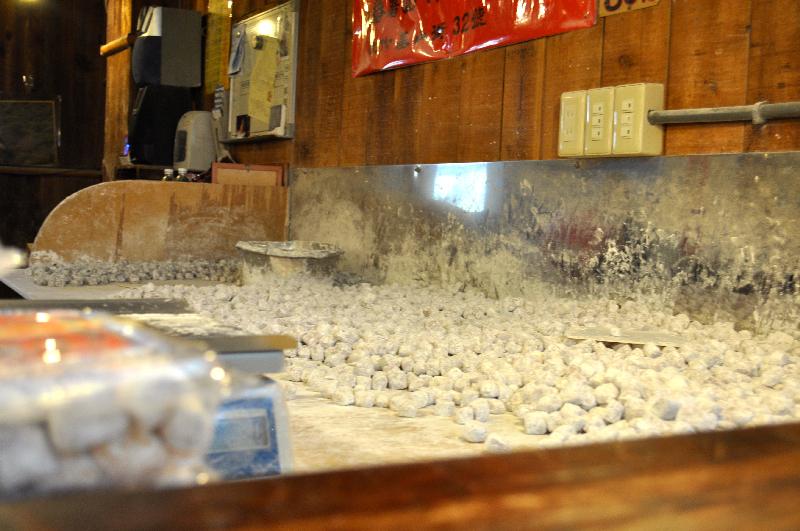 Taro balls… Okay, lunch soon (in Colorado). I have never been to the east side of Taiwan -someday I must go. When I visit there are swarms of relatives on both sides of my family, so I would never get there. Taiwan was a Japanese colony before the Chiang came with mainland soldiers after WWII, and retained a lot of Japanese influence. Don’t you love the stories that come with every food and town in Taiwan? I grew up with my father telling me stories of the land and his family. I read local folklore. I suppose that’s how one falls in love with her homeland, a story and a food at a time. I’d read how there was a memorial near where the camp was to all the Aussies who died in the camp & in the the mines, but the guide didn’t seem to want to talk about it too much to me. Oooh, I would have liked to pressure him/her on the Aussies, but the Chinese/Taiwanese/Japanese cultural influence probably wouldn’t like to share negative stuff. That’s too bad. I bet there is a story. Oh the colours are just magical. I love the narrow streets! Beautiful pics!